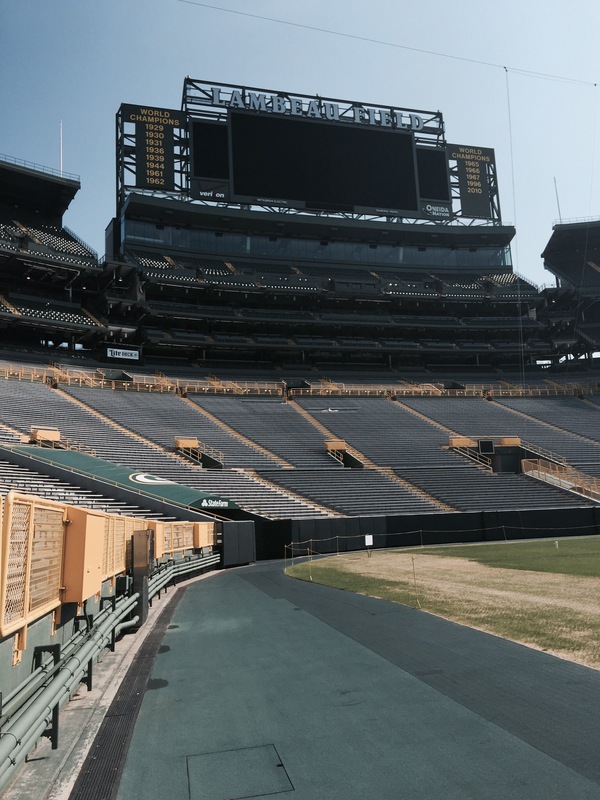 I grew up near near Green Bay, Wisconsin and most of my adult life has been spent away from this hallowed ground. However, I am lucky enough to be a season ticket holder and “owner.” so, with a $312 million project at stake, I thought it might be a great time to check up on the old place. O.K., so maybe I am only one of 360,760 proud owners of the 5,011,558 shares; All joking aside, it has been fantastic to watch the forward progress. 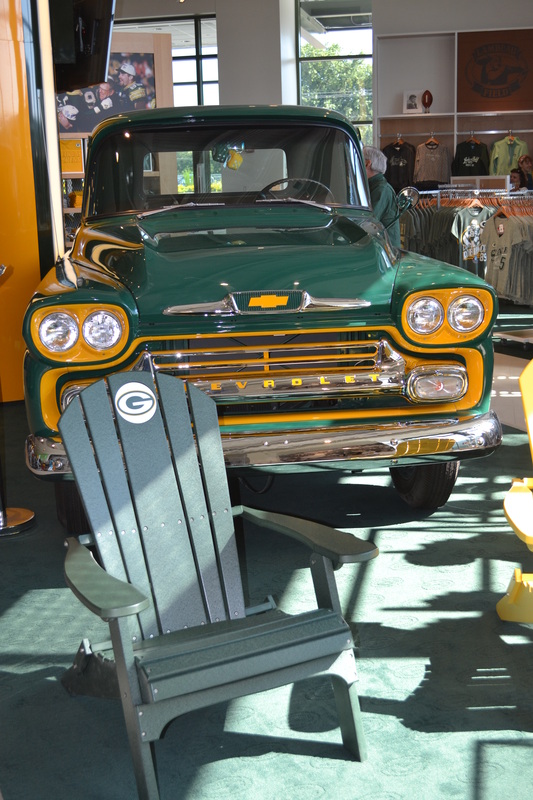 Unique in the NFL, Green Bay Packers have been supported by their fan base and shareholders and are a non profit and publicly owned team. As of 2014, Green Bay, Wisconsin, has a population of 104,891. Located in a neighborhood, where fans can step out of their front door and walk to the stadium. It truly is a team and place endeared by the people. 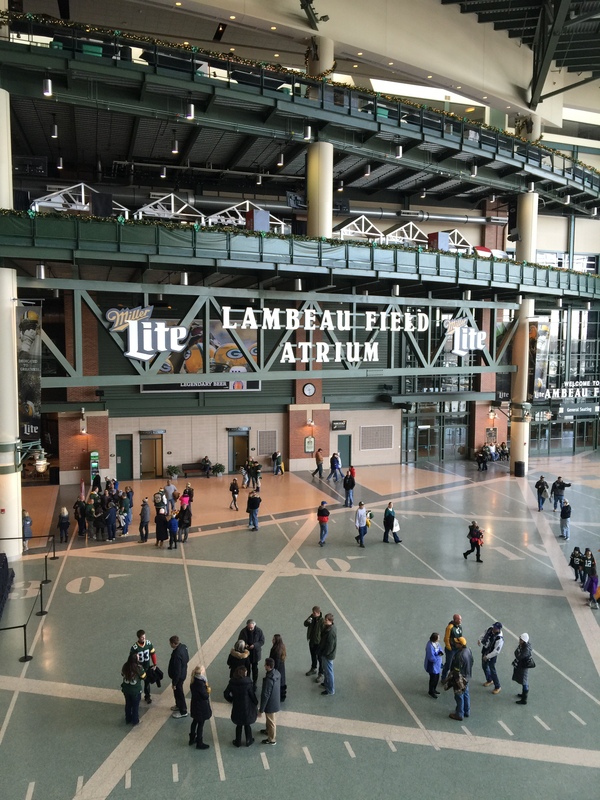 As you drive up to the stadium, you are able to see the statues of legendary Curly Lambeau and Vince Lombardi. Curly Lambeau founded The Green Bay Packers in 1919. He was a shipping clerk for The Indian Packing Company. Along with a local newspaper Editor, an idea was formed and a team put together. The President of The Indian Packing Company agreed to help fund the team if they retained the name, The Green Bay Packers. Curly won his first of three consecutive NFL championships in 1929, and added titles in 1936, ’39 and ’44. 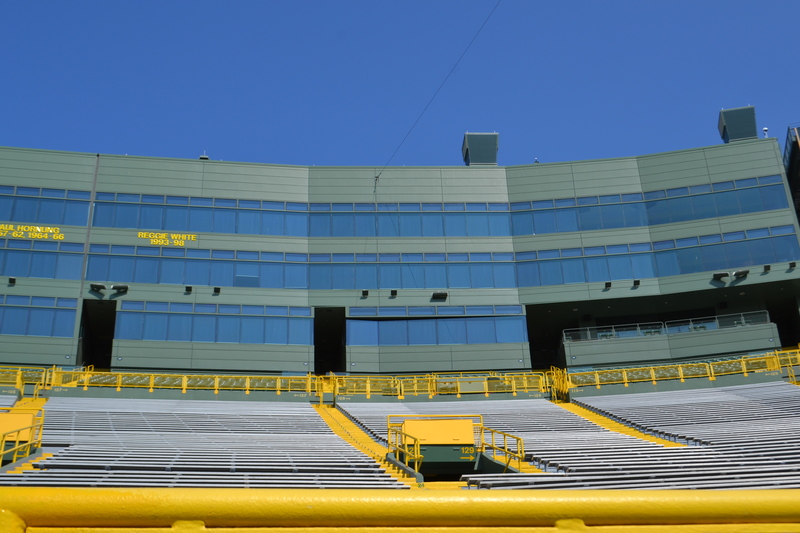 After his death, the stadium named was changed from City Stadium to Lambeau Field. ‘The Tundra” It gets a little cold in these parts. Vince Lombardi, a legendary coach who happens to have a little trophy named after him. Vince was literally larger than life. Before the remodel. I love how the statues loom larger after the remodel. I began my tour at Robert E. Harlan Plaza, named in honor of the former team CEO (1989-2007). A visionary, who helped grow this franchise. yard lines inside. 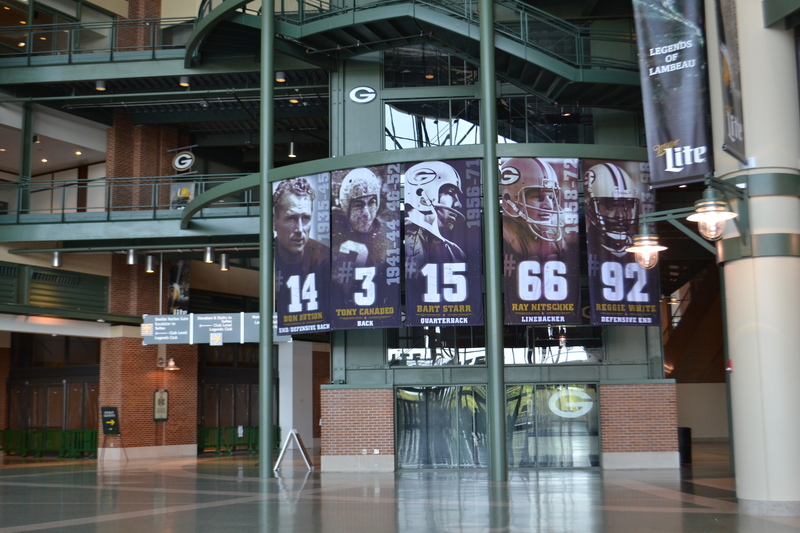 this photo missing the newly added Hall-of-Famer, Brett Favre. I met with my tour guide and group of about 20 people. We were given a brief overview of the exciting changes. We learned that the lines on the floor correspond with the yard lines on the field. There is a huge Pro Shop with something for everyone. Very high quality and unique items are in the shop. New Pro Shop entrance. For perspective this thing is huge! The outdoor entrance to the Pro Shop is super cool. The picture on the left shows the 50 Foot Lombardi Trophy Replica. Obviously, I took that pic in the winter and if you look closely you can see that shiny object. Through this entrance, you pass by the trophy to get to the Pro Shop or the escalator. Very impressive and quite the welcome. 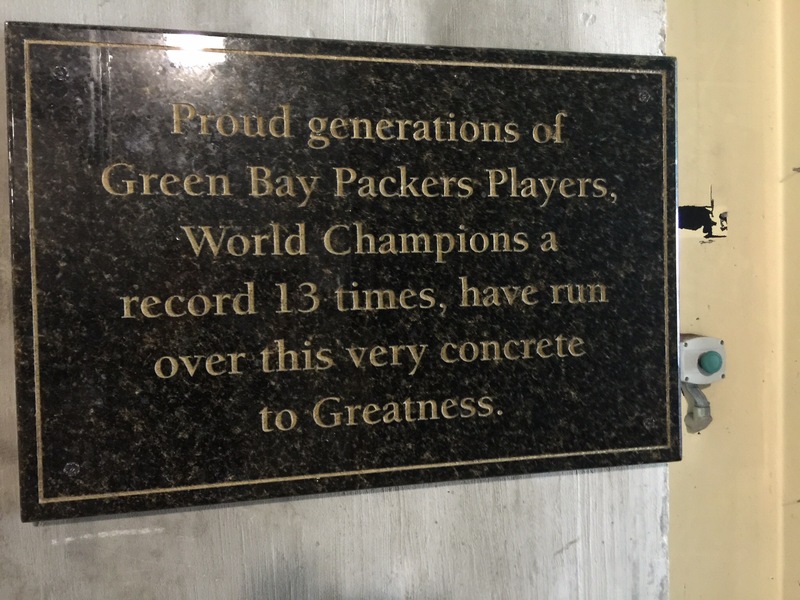 We learned that The Packer’s Hall of Fame is now on two levels and is 15,000 Square feet. We visited a private suite and learned how the other half lives. I especially enjoyed visiting the conference areas and the corporate meeting and events facilities. We learned that the stadium went from being open 10 days per year to 365 days. Many events are now held here and can meet the needs of groups from 25-1200 people. The rooms were state of the art with history and memorabilia abound. We rode the elevator to the top of the South End. 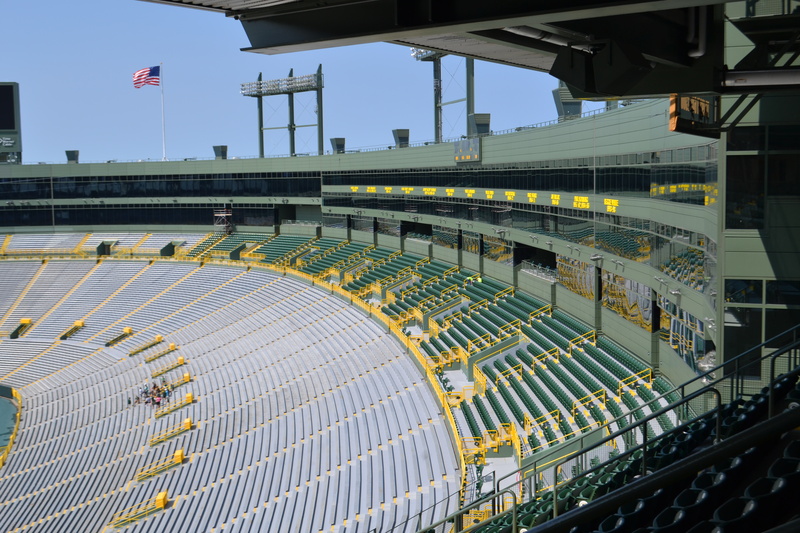 In 2013, a new section which closed the south end-zone structure and features approximately 7,000 new seats, including new premium seating, sponsor and partner areas.and was able to hear how the sound echoes even with 20 people. We got to go even higher up to an outdoor patio area under the big “G” sign and lights. What a cool view! We then took the elevator to the field level. We learned that there have been many state of the art improvements. We were unable to go into the new super cool football shaped swanky locker locker room, but did see a photo hung on the wall. It is very impressive. We walked down the tunnel that leads to the field with the game day music playing. We all loved that part. We walked over a special concrete slab and the tour guide pointed out the significance. Best stated on this plaque. This tour took place not too long after Kenny Chesney and 45,000 of his fans hung out. The field was in the process of rebuilding that beautiful turf. I learned that this franchise has purchased 80 homes and businesses in the area surrounding the stadium. Having already spent $27 million dollars, the plan being to make an area such as the new England Patriots 700 acre complex for fans to enjoy. I highly recommend this tour. Even if you are not a football fan or if your allegiance is with another team, this stadium, The Hall of Fame and the Pro shop really is something to see, and a unique history that plays a part in all of the NFL. Don’t believe me? and the only NFL stadium to make the magazine’s “Top 20” list. ESPN The Magazine in 2009 and 2011-12. The tours do sell out especially near training camp, game day and vacation season. Check the website prior to visiting and show up early.